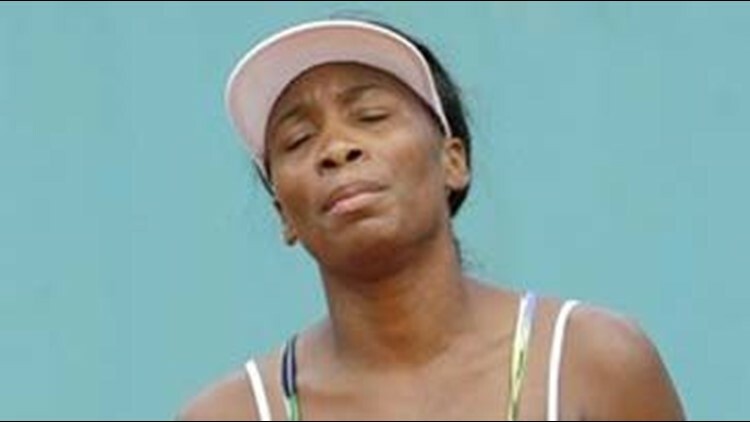 PARIS (AP) - Venus Williams was eliminated from the French Open on Friday, losing in the third round of the clay-court major for the third straight year. The seven-time Grand Slam champion was playing for the third straight day. She lost the first set of her second-round match against Lucie Safarova on Wednesday before play was suspended because of darkness. Williams saved a match point and defeated Safarova on Thursday. Defending champions Ana Ivanovic and Rafael Nadal had little trouble in their matches, both advancing to the fourth round by dominating their opponents yet again. Top-seeded Dinara Safina also won easily in the women's draw. Nadal defeated former No. 1 Lleyton Hewitt 6-1, 6-3, 6-1, and Ivanovic beat Iveta Benesova of the Czech Republic 6-0, 6-2. Andy Murray advanced when Janko Tipsarevic of Serbia retired while trailing 7-6 (3), 6-3. "Always a win against Lleyton is a very good news," said Nadal, who is trying to become the only person to win five straight French Open titles. "You must be playing well." "(The) score doesn't indicate how hard I had to work for some points," said Ivanovic, a former No. 1. "She started playing much, much better in the second set, and started hitting the ball much heavier. I just played really good and stayed in the moment and did what I had to do out there." Safina, the current women's No. 1, defeated Anastasia Pavlyuchenkova of Russia 6-2, 6-0. "When I broke her, I feel I started to play much more aggressive, and then I was dominating," Safina said. "Once you break up, it's easier to go for your shots and to be much more aggressive on the court." Novak Djokovic reached the third round in the men's tournament, quickly completing his suspended match by easily winning the final set and beating Sergiy Stakhovsky of Ukraine 6-3, 6-4, 6-1. The fourth-seeded Djokovic won the first two sets Thursday, but the match was stopped because of darkness. He broke Stakhovsky to open the third set and had little trouble the rest of the way. "It's not pleasant when you don't finish a match in one day," Djokovic said. "But I was lucky to come back and be two sets up." Seventh-seeded Gilles Simon of France was eliminated by No. 30 Victor Hanescu of Romania 6-4, 6-4, 6-2. Hanescu won three matches in a row for the first time this year. No. 29 Philipp Kohlschreiber of Germany also advanced to the third round, beating 2003 French Open champion Juan Carlos Ferrero 6-4, 2-6, 6-4, 6-7 (3), 6-3 in another match suspended by darkness Thursday night. No. 8 Fernando Verdasco of Spain, No. 10 Nikolay Davydenko of Russia, No. 12 Fernando Gonzalez of Chile and No. 13 Marin Cilic of Croatia reached the fourth round.